Where do the world’s richest people live? The old Russian proverb that ‘all money goes to Moscow’ has been validated by the most recent global billionaire hot spot poll, which places Europe’s largest city at number two. 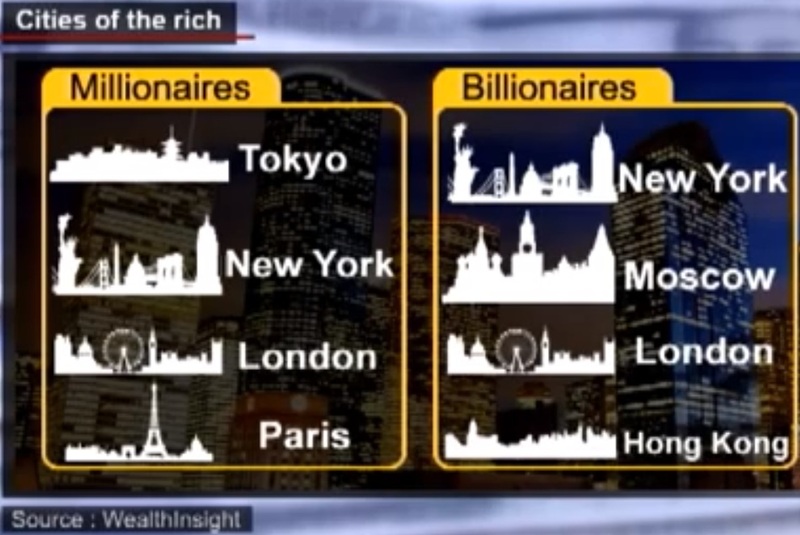 Research firm WealthInsight’s report has ranked the top 20 cities where billionaires reside. The 2012 date puts New York on top with 70, and Moscow a close second with 64. London, Hong Kong, Beijing, Mumbai, Istanbul, Shanghai, Paris, and Los Angeles filled the remaining top ten spots. The figures conflict with the latest poll from the Chinese Hurun Research Institute which reported 76 billionaires resided in Moscow. In terms of multimillionaire hot spots, individuals with a net value of at least $30 million and under $1 billion, Moscow misses the top twenty. London is top of the list as the city with the most multimillionaires (4,224) but Tokyo and Singapore follow in second and third place respectively. Moscow is only home to 101,000 millionaires in 20th place, compared with the leader Tokyo (461,000), followed by New York, which is home to 389,000 millionaires, and London, home to 281,000. The wealthiest Muscovite is mining tycoon and Arsenal football club co-owner, Alisher Usmanov, whose fortune is estimated at $19 billion. Today the assets of the top 200 Russian businessmen are estimated at $488.3 billion, accounting for about 85 percent of the mega-wealthy. Plenty of wealth resides in Moscow, but a lot of Russian billionaires don’t reside in their homeland. Roman Abramovich, the famed Chelsea football club owner, who has a fortune of $10.2 billion, currently lives in London. Former national Sergey Brin, founder and CEO of Google, who emigrated to the US at age six, and claims American citizenship. Brin’s bank account far exceeds all his former compatriots, at $22.8 billion. A country rich in oil, energy, and precious metals, Russia’s wealth is highly concentrated in the capital city. In 2011, 22.1 percent of the GDP came from Moscow, and 27.1 percent from the Moscow region, according to RosStat, the official government statistic bureau. According to the World Bank, Russia’s GDP is $1.86 trillion. Moscow has an official population close to 12 million, according to the Federal State Statistics Service.The number is likely much larger due to the recent influx of undocumented migrant workers. After the collapse of the Soviet Union, state capital found its ways into the hands of a very few powerful oligarchs, and the ‘new money’ consolidated in Moscow. A majority of Russia’s state-owned conglomerates have headquarters in Moscow – Sberbank, VTB, Rosneft, Gazprom, Lukoil, and Roscom all operate from the undisputed financial hub. Moscow is a European hub for international finance institutions- Barclays, HSBC, Credit Suisse, Merrill Lynch, Ernst and Young, KPMG, McKinsey & Co., Renaissance Bank, Boston Consulting Group, all have main offices. Yandex, Russia’s version of Google, which dominates the Russian search engine market, is located in Moscow.